« Have you thought about the children? It’s been difficult to write a post lately. The continued acts of racism in the news are like rocks sinking us to the bottom of some ocean where we are drowning our humanity. Anger rises and I want to lash out. Sadness fogs over me making clarity and vision hard to come by. I am tempted by the numbness of apathy and that frightens me. There are those who count on my apathy, expecting that time will whittle away at my passion for justice until mostly silence is left. There are those who imagine I will betray my commitment by slipping into the coat of privilege that makes it easy to keep out the cold of those who suffer. There are fear mongers seeking to exploit the prejudices I have been fed since birth so as to gorge myself on self-righteousness and personal glory while others starve. Today is 9/11. Today I affirm my refusal to become apathetic and stay quiet in the face of hateful rhetoric based on ignorance and fear. Hate destroys. It did on 9/11. It continues to do so when we allow our fear of what we experience as difference to shrink our minds, cripple our compassion, and lead us to do violence to one another. Enough. Enough. Enough. 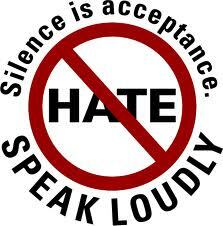 Hate flourishes in silence interpreted as assent. Break the silence.